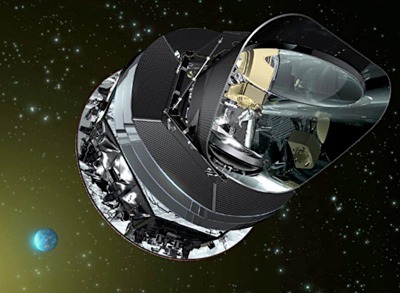 Local Papworth resident Dr Stephen Gratton talked to us about the Planck Satellite which is designed to observe the cosmic microwave background. Stephen is a researcher at the Institute of Astronomy in Cambridge and has a particular interest in analysing the data coming from this space observatory. The instrument was launched in 2009 by ESA and reached the L2 Lagrangian point in space where it sweeps large areas of the sky. The temperature of the microwave background is measured using an array of bolometers operating at distinct frequencies from 857 to 30 GHz. Stephen showed us pictures of the different sized tubes that form the arrays which detect radiation fed from the primary telescope mirror. This radiation represents a microwave background only a few degrees above absolute zero, so the telescope must be cooled with liquid helium and be kept pointing away from the sun. The project has generated vast amounts of data which are being transformed into maps of the sky showing both the foreground radiation from our own galaxy, as well as showing the cosmic microwave background in unprecedented detail. Stephen described some of the preliminary data analysis, but warned us that these were early days, with much more to come. This talk was a nice combination of cosmology and space hardware, enough to satisfy enthusiasts of both aspects of modern astronomy.